After a few weeks in SE Asia, I thought it might be prudent to highlight a handful of headlines that I have had to digest–some of which offer tremendous insight to the pace of things in this part of the world. 1. Demonstrations in Kuala Lumpur: Malaysia’s parliamentary system has come under fire in recent months due to current leadership’s unwillingness to call for elections and perceived systemic inequalities. 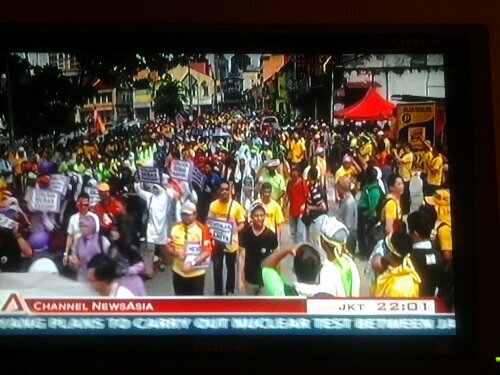 In retaliation the opposition has organized and made their presence known in the nation’s capitol, Kuala Lumpur. Had I stuck around for an extra day or two, I would have found myself smack dab in the middle of a 150,000 person political protest. 2. Tropical storm Sonamu: This little bugger descended on the eastern borders of Malaysia and Thailand after pounding other parts of mainland Asia. I burned many miles to avoid it, but would no doubt have faced inclement conditions and delays had I spent another 12 hours in northern Malaysia. 3. Rice woes: Thailand has officially been overtaken by India and Vietnam as the world’s top rice producer, per data released recently. I suspect they are more then making up for it with tourism revenues though. 4. Baby bust: Singapore is having a birthrate crisis. The government has started focusing on making the ultra-urban city-state more amenable to families in an effort to correct the problem. 5. Myanmar: Burma’s Ministry of Information has continued cracking down on foreign and domestic journalists alike for what amounts to silly, if not absurd, transgressions. This all amidst ongoing ethnic and political tensions that punctuate Myanmar’s slow progression toward democracy. The world is constantly changing. Cliche, cliche. Perhaps I am more sensitive to it due to my surroundings, or perhaps things simply happen faster here. I will leave those official judgements to the folks who live here. Posted in Transworld TourTagged se asia headlines, transworld tourBookmark the permalink. good stuff. you going to make it to burma? have you talked to other travelers that have been there/are going there? Not likely. Have not met anyone who has been through there. Will probably finish this leg in Bangkok or Chiang Mai, as planned.